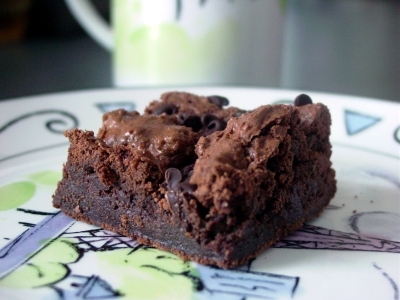 The idea for these brownies has been bouncing around in my brain for a few weeks. I’d found this recipe but was disappointed that the mints weren’t an ooey-gooey layer in the midst of a chewy brownie, but melted with butter and incorporated into the batter. So I set to solve that problem and came up with the following recipe. If there were one thing to change, it would be to increase the amount of Junior Mints. I had a 4.75 oz box (movie size) and it didn’t cover the batter as fully as I’d have liked. I added some mini semi-sweet chocolate chips hoping they’d melt a bit. Having said that, are these good? Yep. Sates a chocolate and mint craving? Yep. Preheat oven to 350-degrees. Line an 8-inch square baking pan with foil, allowing for 2 inches of overhang. Grease foil, excluding overhang. Place butter and 6 oz. chocolate in a microwave safe bowl and microwave for 1 minute at 40-percent power; stir. Continue microwaving at 30-percent power in 30 second intervals, stirring every 30 seconds, until chocolate and butter have melted. Let cool slightly. In a separate bowl, whisk together flour, cocoa, baking powder, and salt; set aside.Place sugar, eggs, and vanilla in the bowl of an electric mixer fitted with the whisk attachment and beat on medium speed until pale, about 4 minutes. Add chocolate mixture; beat until combined. Add flour mixture and beat, scraping down sides of bowl until well blended. Scoop half of the batter into prepared pans (it will be very thick), smoothing the it as best you can with a rubber spatula. Top with Junior Mints, distributing as evenly as possible, and mini chocolate morsels. Dollop the remaining brownie batter over the mints, flatting dollops as best as possible. Bake 30 to 35 minutes. Let cool in pan for 15 minutes and then, using the foil, lift brownies out of pan. Place on a cooling rack and allow to cool completely.